IS there a way to install GIMP 2.10 beside GIMP 2.8 with no errors ?! There is a way, involving renaming profile folders etc which I'm sure someone will repost ITT. But I thought I'd mention that I've installed the portableapps portable version of 2.8 alongside my regular install of 2.10 and I find this arrangement very convenient, without any hassle or conflicts. In Windows, for permanent installations. If Gimp 2.10 installer finds a Gimp 2.8 installation it considers it an update and will install to the same location as Gimp 2.8 Usually C:\Program Files\GIMP 2\ and you have no choice as to location. No good just deleting the old Gimp 2.8 installation, the details are still in the Windows registry and Gimp 2.10 will not install. If you just have a Gimp 2.8 installation and want to keep it. example https://youtu.be/dRsk29KPez4 about 5 minutes. There are variations on this. Backup Gimp 2.8 folder, Uninstall Gimp 2.8, Install Gimp 2.10 to C:\Program Files\GIMP 210\ Restore Gimp 2.8 backup. You can re-install Gimp 2.8 following a Gimp 2.10 installation by renaming folders before and after installations - very messy but works. example https://youtu.be/L9oP_MjGYVA about 5 minutes. The alternative, similar to Zorba, but use a portable Gimp 2.10 with your existing Gimp 2.8 installation. I followed Rich's instructions and had no problems at all (Windows 10). Zorba , rich2005 ,Blighty .. the long way i prefer to keep it for now . the short one the portable , where can i download the portable one ( trusted site) , and if extract the portable there will be no problems like loading errors etc? new update the portable one work (downloaded it from Partha so that where you got your portable ?! ) , but the problem the only plugin worked is "layer effects" ... any one know how to run" Resynthesizer heal selection" in Gimp 2.10 ? (08-10-2018, 11:46 PM)GHARIQfiltafkeer Wrote: new update the portable one work (downloaded it from Partha so that where you got your portable ?! ) , but the problem the only plugin worked is "layer effects" ... any one know how to run" Resynthesizer heal selection" in Gimp 2.10 ? Partha version is strictly 64 bit so you need the 64 bit version of resynthesizer. Attached the plugins to save you hunting. i know even i tried to put the plugins on the 2 portable paths (lib plugins) of partha gimp and using the 64 bit and 32 bit etc etc and downloaded your copy but nothing work except layer effects plugins like beautify did not work "resynthesizer" heal selection is more important for me beside layer effects ..
so where the problem ? can you send me a link to standard basic portable gimp 2.10 with no editing on it ? Quote: ...so where the problem ? can you send me a link to standard basic portable gimp 2.10 with no editing on it ? Nothing that I would care to recommend. I know that resynthesizer works with the Partha 64 bit version. The problem will be somewhere in your installations, probably duplicated files from all your experimentation. Hunt out all resynthesizer.exe/resynthesizer-gui.exe delete and start again making sure you use the correct 64 bit versions. If you are going to use a portable Gimp 2.10 then the Partha version is the best. https://portableapps.com/apps/graphics_p...p_portable 32 bit only As far as I know python not working on this version. 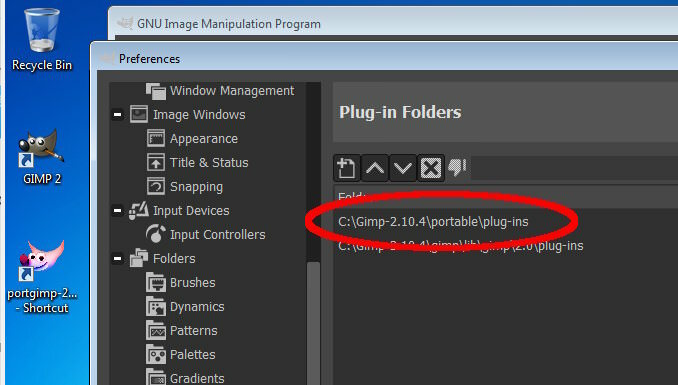 PORTABLE WAY works if you want to use gimp 2.8 beside gimp 2.10 . if you have problems with plugins or scripts not working ) use tested plugins and scripts . 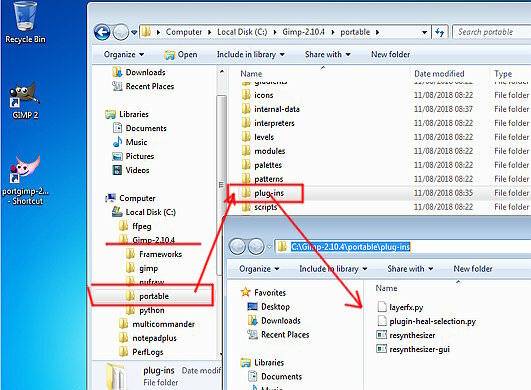 copy them to the portable folder for more safety it is fairly empty so you can delete any plugin or file causes errors easily . beautify plugin need some customization read this thread https://www.gimp-forum.net/Thread-beauti...install-it . and for resynthesizer heal selection use the plugin files that rich2005 uploaded ( thanks ) ." 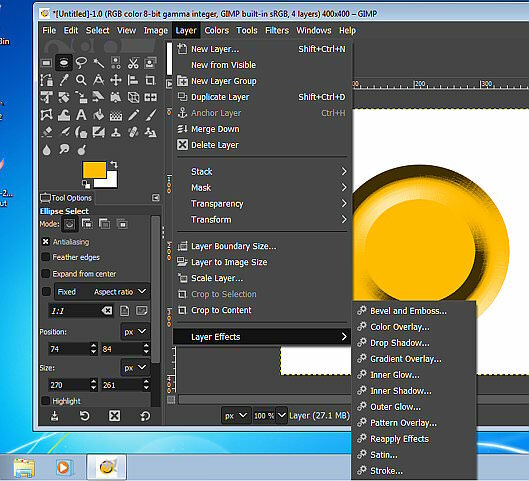 any way get the plugins from your old gimp 2.8 or from another working 2.10 portable from any one you know . (Not compulsory but that worked with me) Do what suits your situation.